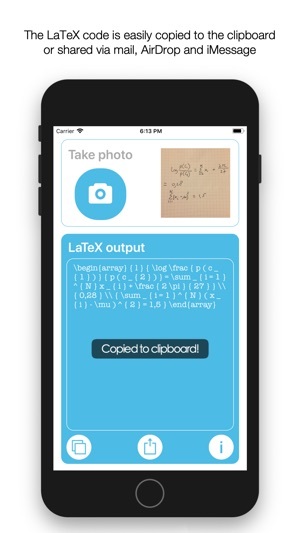 Do you know the problem of having written down a lot of math in your notebook (like answers of big exercises or some proof you had to make) and you still have to write it into LaTeX code, which takes a lot of time? With this app that just happens in a snap! 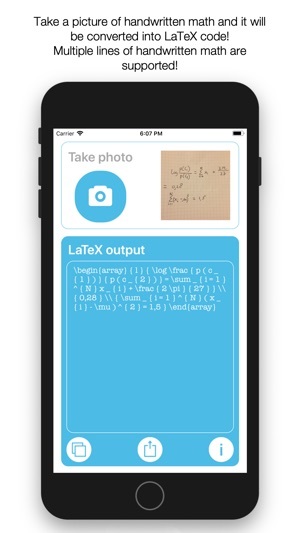 Just take a picture of the math you just solved and it will be converted into LaTeX code! Multiple lines of math are suppported so you can just take a picture of the whole page as long as it's readable! 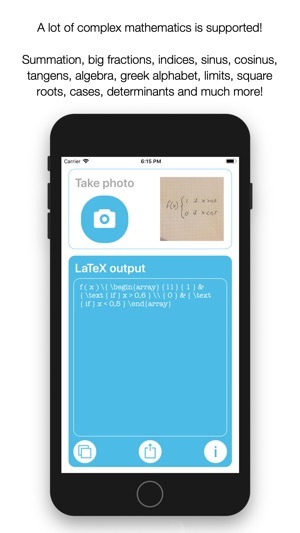 All complex mathematical operators are supported; indices, summation, product, power, square root, exponents, determinants, cases, limits, greek alpabet, algebra and of course all simple operators as well!